Tah-dah!! 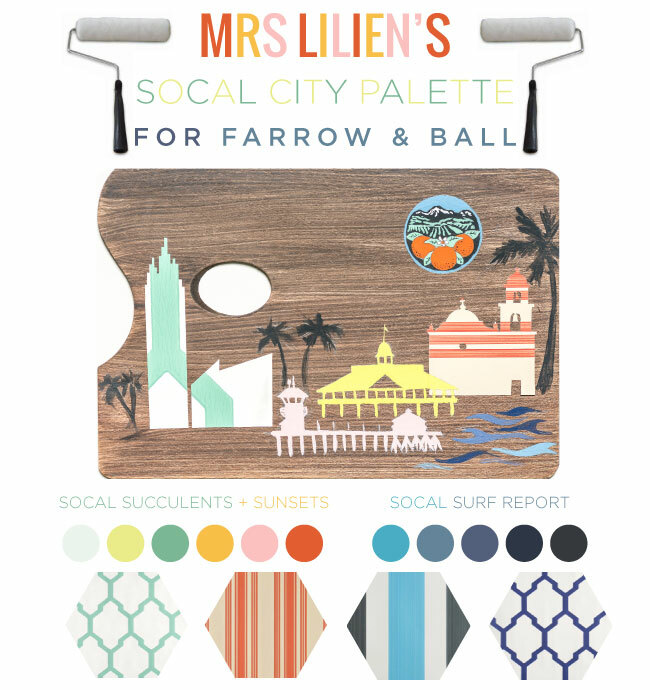 Herein lies the newest and most smashing paint + wall paper palette for Farrow & Ball - I was bestowed the high honor of curating the SoCal City Palatte, and today I'm sharing it with y'all!! If you're unfamiliar with this bespoke British brand - they are the makers of fine designer paints + papers that beckon a high demand. Our fabby collaby is special indeed - I'm their SoCal ambassador, a position that's pretty darn sweet! I've thoughtfully selected a collection of paints and papers that I feel best represent my SoCal habitat - the double palette above is spot on and makes me happy-clap! The SoCal Succulents + Sunsets collection is vibrant, warm and punchy - it encapsulates this region's extraordinary personality which is both lively + sunny. The SoCal Surf Report embodies the brilliant blues of our beloved Pacific - a palette thats clean, serene, deep + terrific! I could not be more thrilled about these palettes I've created - I hope you take the time to peruse this collection that I've passionately illuminated. If your space in which you occupy is in need of a SoCal revamp - I invite you to explore these custom Farrow & Ball palettes that bear my MRS stamp! There's more splendor on this Farrow & Ball front that I'll be sharing soon - you'll be patiently attentive whilst awaiting my surprise, I presume.